While Metro has been touting its Get Back to Good ("Back2Good") plan and campaign, unfortunately, it is still continuing to mess up big and stupid. Part of Metro's hailed upgrades is to the new 7000-series trains. They look better than the old crappy and filthed up train cars from before--including the extremely worn and ripped icky orange seats and carpets. In that respect, the stainless and more modern-looking replacement trains are most welcome. 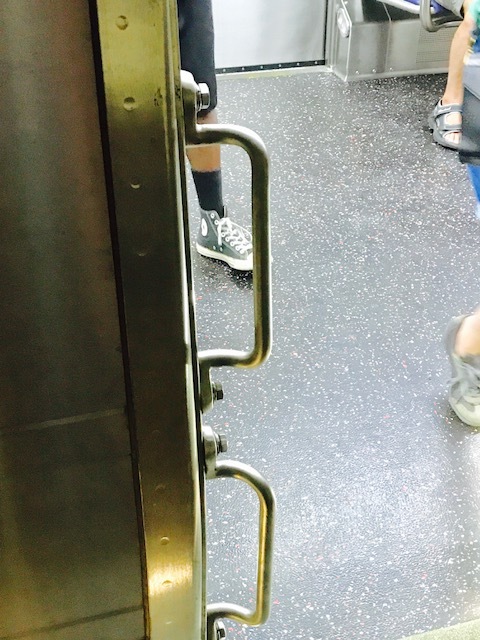 However, check out the negligent and hazardous middle doors on many of these train cars. Do you see the absolutely stupid handle bars that jut out into the oft busy entry-exit passenger doors. Yesterday, I got caught in a mob racing out of one of the train cars, and my upper thigh got danged and good on these ridiculous and reckless handlebars in the doorway! Who would put these jutting out into a doorframe??? Anyway, my leg is red, swollen, painful, and I am limping good from this. Hey, is there a good personal injury lawyer out there on the web that works on commission (lol, I think)? I am so grateful to G-d if this doesn't end up messing with my hip replacement. What is it about Metro that they just seem to act brainless with the basics. This was supposed to the year of getting back to track safety and train reliability (getting the trains on time), but I guessed they seriously missed the train safety part!